Justrite Manufacturing Companytanding rinse tanks provide a space where larger parts (up to 35 in. wide) can be immersed. The self-closing cover is foot-treadle operated, allowing it to be opened by a worker with hands full. 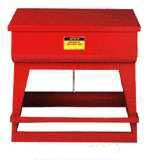 An adjustable-rate pneumatic check prevents the cover from slamming shut instantly when the treadle is released.